The 200 and 300 TDi are tough, durable engines which will normally run for big mileages with routine maintenance. I have had these engines apart with 250,000 miles on the clock and the bores, pistons, crank journals, camshafts etc are almost unworn. However, the 200 TDi had a few weak spots, and when Land Rover reworked the design to produce the 300 TDi, ill-advised cost cutting introduced a few more. The key problems I am aware of are listed below - if you know of anything that you think should be on the list, please feel free to contact me. This is the killer. It is not unique to the TDi family, and can happen on the earlier 2.5 diesels as well. It is not that common on 200 TDis and almost unknown on 300s, but happens often enough that you need to be aware of it. The camshaft bearings are pressed into the block and then line-reamed to provide the correct bearing clearance for the camshaft. In certain circumstances, and particularly if an engine has been run very hot, one or more cam bearings can work loose and 'walk' out of position. This exposes the oilway which feeds the cam bearing, resulting in almost complete loss of oil pressure. The really bad news is that if it happens on the motorway, the oil pump will generate just enough pressure at speed to keep the pressure warning light out, but not enough to keep the crankshaft and pistons lubricated. By the time the oil light finally comes on, the destruction of the engine internals is pretty much complete. Usually the first sign of trouble is an oil light that flickers at idle. If this happens to you, do not ignore it. Don't panic immediately - the sender unit for the oil light can fail and give this symptom. But if you change the sender and the light still flickers at idle, you will need to investigate further, and that means taking the camshaft out. A worn oil pump will also give low oil pressure, but TDi oil pumps are massive and robust and seldom give problems. Replacing camshaft bearings is a machine shop job, and if the offending bearing has spun in its housing, the block will be scrap. These engines have an aluminium cylinder head on an iron block. The two metals expand at different rates, so even though the head is bolted down tight and dowelled as well, head gasket failure can occur typically from around 120,000 miles upwards. For vehicles used for multiple short journeys problems may appear at a much lower mileage. There are several different types of failure. What most people think of as a 'classic' head gasket failure - overheating, pressure building up in the cooling system - is not all that common, and quite likely to be the result of a failure elsewhere in the cooling system causing the engine to overheat and warp the cylinder head. This is more common on the 300 TDi than the 200. The 300 has the water pump mounted very high up, so the coolant level does not need to drop far before it no longer reaches the pump. (The 200 can lose about two thirds of its coolant before having circulation problems). The gasket between the water pump housing and block on the 300 is also weak and prone to leaking. It is good practice with any engine to check coolant level weekly and before any long journey: with the 300 TDi it is vital. These engines will punish you heavily if you neglect this task. 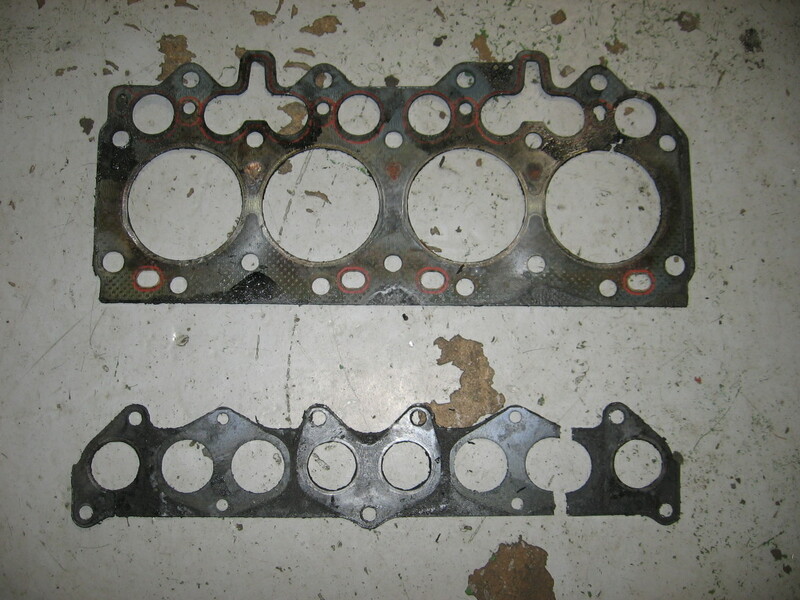 More common is a failure of the head gasket between number four cylinder and the rear edge of the head. This creates a 'chuffing' noise - if you run your finger along the join between the back of the head and the block you will be able to feel the exhaust gases pulsing out. Perhaps the most common failure point is between one of the cylinders and a pushrod tube (again, usually number four cylinder). This gives you a whole variety of alarming symptoms. The engine will run very roughly, blow oil out of every single joint and seal, and if you remove the oil filler cap huge quantities of smoke will belch out. At higher revs the engine may also start to 'run away' due to oil being drawn into the affected cylinder. A fair few people have been persuaded to pay up for a reconditioned engine on the strength of these symptoms, when all that is needed is a new head gasket. Replacing the head gasket on a TDi engine is not difficult, although you may find some nasty surprises when you lift the head (see 'head cracking' below). TDi heads are fairly robust but can develop cracks in the casting, especially if badly overheated. The 300 head seems less strong that the 200. Cracks around the heater plugs and injectors are pretty common and can be ignored if very small. Cracks between the valves are more serious as there is the danger that these will spread into the waterways in the head, and also that they may cause the valve seats to work loose and drop out of position. If removing the head for any reason, it should be throughly inspected for signs of cracking. 300 TDi heads are available new and surprisingly cheap for such a major component. 200 heads have been unavailable for several years. At the moment there are still enough good used heads around to meet demand, but I suspect that before long people will have to start looking at having cracked heads welded up. More common on 300 than 200, and I have no idea why. Possibly something to do with the exhaust manifold design, as the manifold bolt pattern is identical and the 300 gasket looks stronger than the 200. On a turbodiesel engine there is always a little oil in the induction system, from the turbo bearings. The manifold gasket cracks across the ports, and with the inlet manifold being pressurised by the turbo, oil is blown out through the cracks and plasters the side of the block. Not serious, not hard to fix, but very messy if you leave it for long. The 200 TDi has no fewer than eight rubber seals on the rocker cover - three conical seals under the securing bolts, an 'O' ring on the oil separator, half-moon seal at each end of the head, gasket between rocker cover and head, and an oil seal in the filler cap. All these seals harden with age and leak. On the 300 the half-moon seals were deleted, and the conical seals replaced with rubber rings on the head bolts. I have seen TDis that were leaking enough oil onto the exhaust manifold to constitute a fire hazard. If your engine is leaking oil onto the head, change all the seals - they are not expensive. The half-moon seals benefit from a small amount of RTV sealant in the groove to help them seal properly, but there should be no need to use any kind of sealant on the rocker cover gasket. The Garrett T25 turbocharger is a durable old beast and can easily do 200,000 miles or more on a well-maintained engine, but failure is not unknown. Remove the air intake pipe, grasp the end of the impeller and check for play. A little side to side movement is normal, but there should be no fore and aft play. Some oil mist on the inside of the intercooler and pipework is acceptable, but if liquid oil is accumulating in the pipework, or the vehicle emits blue smoke from the exhaust when accelerating, the turbo is probably past its best. In the end the bearings will collapse, destroying the seals and allowing oil to be pumped into the engine. Diesels run very well on hot engine oil, your engine will run away and eat itself. A badly worn turbo will often whistle loudly, especially once the bearings have worn enough for the impeller blades to catch on the housing and get bent out of shape. The wastegate can seize shut, especially on engines that have been left standing. This leads to excessive boost pressure which is not good for the life of your engine. You should be able to move the wastegate arm against the spring-loaded actuator with a pair of pliers. If seized, you can normally detach the actuator and work the arm back and forth until it moves freely. The diaphragm in the actuator can split, as can the pipes that run from there to the injection pump, resulting in a loss of power as the injection pump is no longer able to increase fuelling in response to turbo boost. And very occasionally the bearing for the wastegate arm will move in the housing so that the wastegate flap no longer lines up with the port it is supposed to cover, resulting in no turbo boost at all. Turbo boost can be measured by plumbing a boost gauge into the actuator pipework, and adjusted using the threaded adjuster on the actuator pushrod. Almost unknown on the 200TDi, very common on older 300s. The timing case is not strong enough and can be distorted if the precise sequence is not followed when building up the engine and fitting the injection pump. This puts the injection pump pulley very fractionally out of true, and the belt then rubs against the shoulder on the tensioner. It gradually wears until it is about half its original width, then breaks, often at only half the recommended change interval. Land Rover recognised this problem quite early in the 300 TDi's life and introduced two modification kits, depending on the exact age of the engine. One includes a new timing case, and a redesigned tensioner, idler and crank pulley. The other consists of just the tensioner, idler and pulley. Not all engines were affected, and there are still a fair few 300s running the early tensioner setup with no problems. The only way to be sure is to remove the timing cover and have a look inside. If the timing case is full of black fluff and one edge of the belt has been worn away, you have an alignment problem. For more information click here. The bolt at the front of the crankshaft is done up to a high torque and Loctited for good measure. To remove and refit it (when changing the timing belt) you need a crankshaft locking tool. People try to do the job without, and as a result the bolt is not sufficiently tightened. They usually don't bother with Loctite either. So the bolt comes loose. The front pulley and the toothed pulley for the cambelt start to move back and forth on the crankshaft and very quickly wear away the locating keys, and chew up the grooves in the crankshaft nose that the keys sit in. Usually by this stage the engine is running very badly due to the timing being well out, but if left long enough the key shears, valves hit pistons, clatter clatter bang and you might be looking at a new engine (although more often it just bends the pushrods into strange shapes). If the damage to the keyways is only very slight you may get away with new keys and pulleys and plenty of Loctite, but I have seen a few engines where there is not enough left of the keyway to hold the key in position, and that means a new crankshaft. Both the 200 and 300 use a Bosch VE rotary injection pump. This is a strong, proven unit fitted to countless millions of vehicles. However, it is not immune from problems. A few years ago there was a spate of pump failures where the internal components started to break up, filling the pump with fragments of metal. This was attributed to poor quality supermarket diesel with inadequate lubricating properties. Usually the first sign of trouble was an engine that continued running when the engine was switched off, due to the plunger on the stop solenoid being jammed with small metal fragments. There are likely to be a few pumps still about which are damaged, but not enough to stop them from running. So if you have an engine that will not stop when switched off, take a good look inside when you remove the stop solenoid. Any metal fragments are bad news. More recently, and coinciding with the peak of the great biodiesel craze, I had a spate of pump failures due to serious corrosion of the internal parts. Something sitting in a bath of diesel should not rust, and the only possible cause I can think of is badly-processed biodiesel or cheap vegetable oil with a high water content. I haven't seen one of these failures for a while now, but it has made me very wary of recommending the use of vegetable oil (either virgin or recycled). A reconditioned pump at £600 will take a big chunk out of the cost saving on the fuel. The 200 TDi uses a vane type rotary pump to power the brake servo, driven off the end of the oil pump drive. This is exactly the same unit used on the older 2.5 engines and near enough unbreakable. Loss of servo assistance on a 200 TDi is much more likely to be a failed servo than a faulty pump. The 300 however uses a Wabco plunger type pump driven off the camshaft, and these pumps are a pain. Two main problems: firstly the end cover works loose (it is riveted on) leading to oil leaking around the cover plate. Secondly the internals often wear, giving a regular ticking sound which increases with engine speed and sounds a bit like a misadjusted valve rocker. Eventually the internal wear becomes great enough for the pump to stop working, and they aren't cheap. There was a duff batch of OEM pumps released onto the market last year which tended to fail after about 30 miles, but hopefully they should all have been recalled by now. The 300 TDi uses a single flat multi-ribbed 'serpentine' belt to drive the cooling fan, water pump, power steering pump and alternator. It has a spring-loaded self adjusting tensioner. On older 300s it is not uncommon for the belt to make a 'chirping' noise, especially at low speeds, due to slight misalignment of the pulleys. The two most likely causes are: 1. Worn tensioner bearing - can sometimes (but not always) be detected by removing the tensioner and spinning the pulley. Spraying white grease into the bearing may temporarily cure the problem. 2. Worn cooling fan hub bearing. This bearing is built into the timing cover and is non-replaceable. When it wears you have to replace the whole cover which is Genuine Parts only, and expensive. There should be no side to side play in the fan hub - if it waggles about the bearing is shot. Both 200 and 300 have a viscous coupling built into the cooling fan, and these fail with age, resulting in a tendency to overheat in heavy traffic. With the engine hot and stopped, if you can spin the fan freely with no resistance the viscous coupling is shot. It is screwed onto the drive pulley with a left-handed thread and needs a special spanner to remove. The 200 TDi has a robust, old-fashioned water pump which will eventually wear out - either the bearings fail (check for side to side play in the pulley) or the seals go (water leaks from around the spindle). The 300 TDi has a smaller, cheaply made pump which suffers from the same problems, but it is also not unknown for the impeller to fall off the spindle. If you have an overheating problem with no obvious cause, it is worth removing the water pump to check that the impeller is still attached. Both 200 and 300 have caps on top of the valve stems to reduce wear on the ends of the valve rockers. At high mileages, and especially if valve clearances are too wide, the valve stem can punch the centre out of the cap, resulting in slight loss of power and a loud tapping noise from under the rocker cover. Caps can be replaced without having to remove the rocker shaft - just loosen the adjusting screw until there is enough room to extract the remains of the broken cap and pop in a new one.